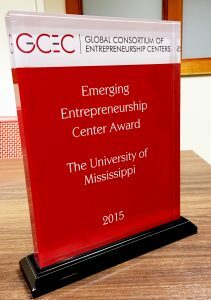 The University of Mississippi Center for Innovation and Entrepreneurship received the Emerging Entrepreneurship Center Award at the Global Consortium of Entrepreneurship Centers conference. The Global Consortium of Entrepreneurship Centers (GCEC) awarded the University of Mississippi Center for Innovation and Entrepreneurship (CIE) the Emerging Entrepreneurship Award on October 31st at its annual conference in Gainesville, Fla. The GCEC distributes the award to the best up-and- coming university entrepreneurship center in the United States and Canada. The University of Mississippi CIE shared the first-place win with the Hunter Centre for Entrepreneurship and Innovation at the University of Calgary in Alberta, Calgary, Canada. This was the CIE’s first time to compete for the award. Award recipients participated in a multi-round judging process that began in July and concluded this past week. Each applying center had to be nominated, and a five-page description of the centers’ goals and programs had to be submitted to the judging committee. For the Emerging Entrepreneurship Center Award, the nominated centers had to be less than 5 years old. The Global Consortium of Entrepreneurship Centers, established in 1997, was developed in order to facilitate communication and collaboration between entrepreneurship centers and is comprised of members from almost 300 universities from the United States and other countries. The international consortium hosted its largest conference to date, with approximately 340 university and college representatives present. Dedicated to the success of student entrepreneurs at the university, the CIE was developed to inspire students to create innovative businesses and enhance the economic value of all businesses within the state of Mississippi. The CIE is an independent program that runs in conjunction with the Ole Miss School of Business Administration.